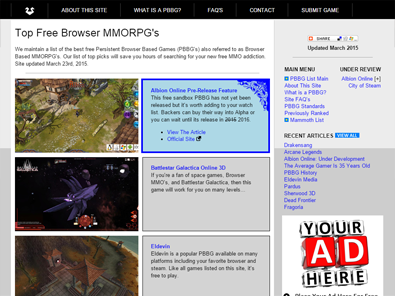 The primary purpose of this site is to promote PBBG's, otherwise known as browser based MMORPG's. There are plenty of sites that promote MMO's, most of them get a lot more traffic than this site. But this site is specialized and has strict rules restricting what can be top ranked. 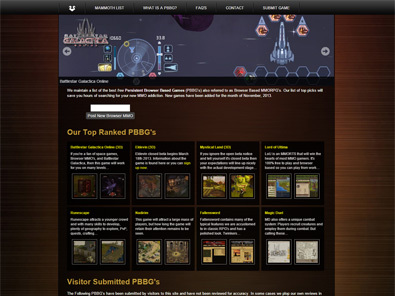 So while other sites try to list all MMO's, this site aspires to present you with only the best, and within the PBBG sub category. This means that a very high percentage of visitors to this site are getting exactly what they are looking for, while a very low percentage of visitors to more popular sites are having a hard time finding what they are looking for. This is due to the fact that PBBG's found on more popular sites get buried within 1000's of pages while the same games are featured on this site. 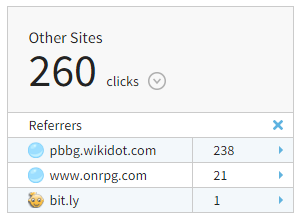 For example, I cannot compete with the very popular onrpg.com site, yet most of the time, I can generate more clicks to a web based MMO than a site like ONRPG. This is clearly shown by comparing a shared bitly link between both sites, as seen to the left. The image above is a screen grab from bit.ly showing the number of clicks gained for the Eldevin PBBG over the course of about a year. The number won't impress you, but it very clearly illustrates how a small site like mine can remain relevant when compared to a much larger community site. This is why many users, including myself, visit both mainstream and independent fan sites. As another function of the site, I have more recently added a list of my all time favorite PC games. This is something that I've been wanting to do for some time now and I will eventually post reviews for each of them but progress is slow. I see the point in having a 2nd site for the PC Games but instead I decided on an unholy marriage of the two; PC Games and PBBG's. 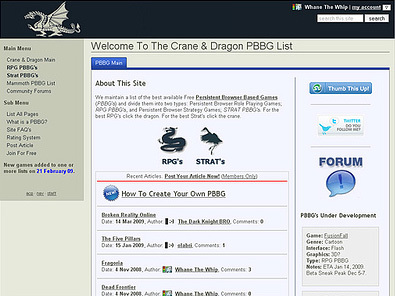 The PBBG Lab gained deep roots as the former Crane & Dragon PBBG site dating back to November 23rd, 2007. The C&D site is still up but redirecting here. That site was in fact, the first wikidot site that I built and Pardus was the 1st PBBG that I reviewed. Since then there have been several incarnations of the website with the last version dating back to November 2014 and the most current version launching in November 2017 to include a new domain. However I was not entirely happy with the domain name and so I set a 1 year goal to decide on a better name. I was 4 months late. 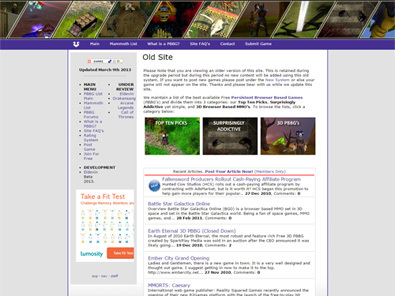 The site as you see it now is the 5th major update to the original site and at the time of this writing, is about 12 years old. Would you like to know a little more about the history of PBBG's?